Originally published in “It’s About Times,” the Abalone Alliance newspaper, December 1981-January 1982. 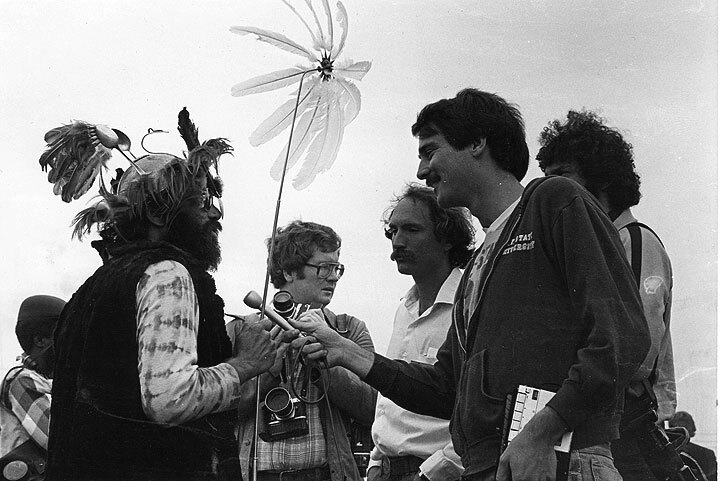 The "feather man" was often the focus of media attention at the Diablo Canyon blockade in September 1981. Some reporters seemed to make a special effort to photograph the blockade's most bizarre participants. 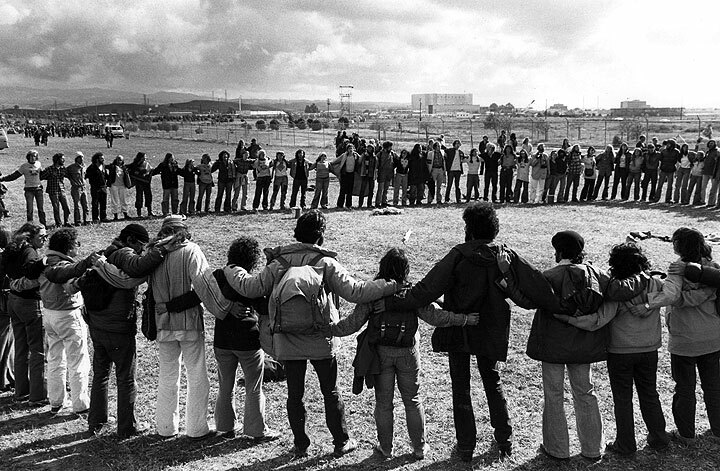 Gary Rouge, an eyewitness to the Diablo Canyon blockade of September 1981, described the permeation of New Age social movement subscribers in the occupation. Rouge’s anecdotes highlight the tenets of New Age theory and their effects on the organization of the blockade. The PG&E Diablo Canyon nuclear power plant was occupied shortly after it was granted a license to operate, one of the many protests calling for the shutdown of the plant led by the Abalone Alliance from 1977-1985. The blockade continued for two weeks and resulted in the arrest of almost 2,000, the most arrested at any anti-nuclear protest in the United States. The organizers deemed the demonstration a success after the plant’s reopening was delayed due to a structural error. The people who watched the Diablo blockade on television could easily have concluded that 2000 New Age clones of the infamous Feather Man had swooped down on San Luis Obispo. This pigeonhole reporting ignored the numerous other influences on the blockade—the Cal Poly faculty and staff, the ordinary folks, the local residents who kept bringing food supplies to the camp. On the other hand, it. is true that the blockade and the camp were permeated with the New Age style—by which, I mean more than long hair, embroidered Mexican shirts, or an earring in one ear. The style of a movement or subculture also refers to its shared assumptions, attitudes, customs and taboos. It is the cultural reflection of its political views. Pardon the laundry list, but it was painfully obvious that the blockade had attracted very few "people of color," punk/New Wave elements or working class suburban types. The projected style of the "visible" anti-nuke movement tends to isolate it from millions of people who hold anti-nuclear views but just don't recognize themselves in the cultural norms of the movement. An example. On Tuesday, the day the blockade actually began, I gave a ride to a young Chicano who had come from Los Angeles for the blockade. But he had decided to hitchhike back home because he felt so out of place at the camp. Someone with a name like Cosmic Dust, who was a mellow white Aquarian between 20 and 35 years of age, into nonviolent vegetarianism and the owner of 2.5 pairs of hiking boots, would have felt instantly validated upon strolling into camp. In contrast, my anti-nuclear Latino passenger felt like a stranger in a strange land. As I left him off at the freeway ramp, he had some second thoughts and started talking about trying to come back up with some friends. But that was the last I saw of him. One blockade custom that seemed a bit strange was the habit of hugging anyone who happened to come within a ten-yard radius. Some would argue that this "builds community." And I agree that hugging friends, with whom one has shared enough discussions, laughs, and experiences to form a real emotional bond feels wonderfully and uniquely human. But does a minimal political agreement instantly constitute that kind of emotional intimacy? I wound up feeling emotionally homogenized by the "completing the circle" ritual which, like clockwork, was "spontaneously" suggested at the end of nearly every meeting. Diablo protesters completing the circle. There are a lot of people who shy away from a movement in which "touchy-feelyism" is the norm. Some are repelled out of unfamiliarity with it, others out of a conscious criticism of its psychological and theoretical underpinnings. These ideas do contain a radical kernel of truth, in that national boundaries are artificial barriers which prevent the organization of a cooperative global community. At the same time, they blur the way that a small but immensely powerful side of the "family" pursues goals divorced from the interests of the rest." These deviants of the ruling class persuasion dictate as the terms of alimony their exclusive legal custody of the world economy, and unlimited visiting rights in all major cultural and political institutions. Through various forms of thought control, this family rift is made to appear as something “natural” and thus politically irrelevant: “Father knows best.” Curiously enough, many New Ageists wind up implicitly accepting this domestic compromise. It is a New Age affliction to be overtly polite and respectful. This “niceness” dooms its adherents to remaining merely questioners of authority, rather than its abolitionists. Underlying this symptom of gently overlooking class antagonisms is a collective amnesia about history. The Diablo blockade handbook, for example, absurdly implied that the militant and sometimes bloody actions in defense of working class gains by the Wobblies and the Flint sit-down strikers fit the same mold as the pacifism of Gandhi, Martin Luther King and the Abalone Alliance. This kind of historical distortion, whether due to ignorance or manipulation, only deludes and dilutes the debate on the social questions of today. A one-hour conversation between Sasha Lilley of KPFA's "Against the Grain" and Barbara Epstein, scholar of the direct action social movements of the 1970s and '80s. Originally broadcast by Against The Grain.